Toughest Mine Safety Tool At Risk In Federal Hearing Massey Energy's motion to dismiss the Labor Department's attempt to close Freedom Mine may limit mine safety enforcement. Lawyers for the Labor Department and coal mine giant Massey Energy are gathering in Covington, Ky., for a landmark federal court hearing Friday that could determine whether the toughest mine safety tool ever used is as tough as it appears. 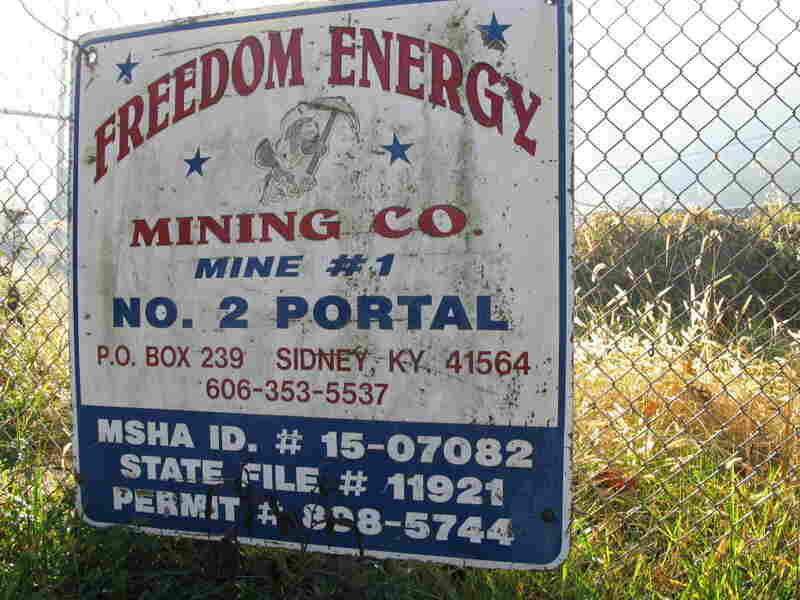 The hearing involves Massey's Freedom Mine No. 1 in Pike County, Ky., and the Labor Department's attempt to have a federal court essentially seize control of the mine, order safety fixes and supervise compliance. This "injunctive relief" option in federal mine safety law has been on the books for 33 years, but was never used until November, when the Labor Department filed its case against Freedom. The agency's action is part of the Obama administration's purported get-tough response to the deadly explosion at Massey's Upper Big Branch mine in West Virginia in April. Massey Energy decided to close its Freedom Mine in Kentucky after it was targeted by federal regulators for the toughest enforcement action ever. Freedom has a similar safety record with hundreds of safety violations, citations and fines. "If the court does not step in, someone may be seriously injured or die," argued Joe Main, assistant secretary of Labor for mine safety and health. "Freedom Energy has demonstrated time and again that it cannot be trusted to follow basic safety rules." The unprecedented federal court hearing Friday focuses on a Massey Energy motion to dismiss the case outright. Massey has already announced it will close the mine, but it does not argue in its motion that its voluntary shutdown makes the case moot. It doesn't even mention its intent to close Freedom for good. That may be an indication that Massey wants to make a strong statement with a court decision that could effectively kill the option of going to federal court again to force mine operators to comply with safety regulations. "MSHA needs to have the authority to go to federal court," says Ed Clair, who spent two decades as the chief lawyer for the Mine Safety and Health Administration until his retirement last year. "And get the court to require mine operators to address continuing hazards or face contempt of court." Even if it hadn't been used before, Clair adds, the threat of federal court seizure and supervision "had some deterrent value." Without it, mining companies can continue to amass thousands of safety violations, citations and fines that remain unresolved for years in an administrative court system that is already overwhelmed. Massey argues in its motion that the Labor Department's case is based on "vague and conclusory assertions that fail to inform the court of any plausible basis for shutting down the Freedom #1 Mine." Many of those citations, violations and fines, Massey argues, are common in the industry and are not actually final until an administrative law court considers them. Massey and other mining companies have appealed 18,000 of these safety enforcement actions. Massey also contends that the agency failed to first formally establish a "pattern of violations" at Freedom before hauling the company into federal court. "Massey does make the arguments that concerned me when I was associate solicitor," Clair said. "We decided to use other enforcement tools that had proven successful in improving compliance with less legal risk of losing in court." In this case, he adds, "an adverse decision [for the Labor Department] could have the effect of writing [the injunctive relief] section out of the law, and that would be a shame." The Labor Department argues the case should not be dismissed, and should still go to trial, contending that the law does not require violations to be formally defined as final before they count as persistently dangerous and threatening behavior in a coal mine. The agency also maintains in its response to Massey that the company is confusing two separate sections of federal law. Both refer to a "pattern of violations" and enforcement actions federal regulators can take in response. MSHA needs to have the authority to go to federal court and get the court to require mine operators to address continuing hazards or face contempt of court. One section of the law requires a series of defined steps before a mine can be formally labeled as having a "pattern of violations." The section used to take the Freedom Mine to court refers to a "pattern of violations" but does not define that phrase. Since the Labor Department has never used this section of the law, a court has never provided an interpretation. The agency said last month that it would seek federal court injunctions against other mines with persistent and serious safety problems, but no other cases have been filed so far. Massey has insisted the Freedom mine is not unsafe, and that its size and age make it a challenge to maintain. If the case is not dismissed after Friday's hearing, it is scheduled for trial Jan. 4 in Pikeville, Ky., and there are indications that Massey's safety and production practices could come under intensive court scrutiny.